Jotting this down here real fast because I keep losing track of the upgrades I want to do and the supplies required to do them. fantasia wrote: Jotting this down here real fast because I keep losing track of the upgrades I want to do and the supplies required to do them. A hunter on the MH Forum posted a picture of all the upgrade requirements. I'll quote his post, including the link to his picture - the picture was too large for the MH Forum, and it will be too large here, and it's less spoilerish to just post the link. 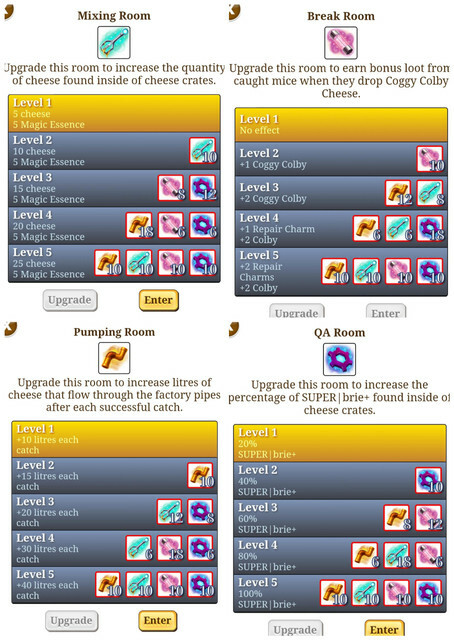 Each room's level 5 upgrade costs 10 of each of the event's four resources. It helped me to see the system in the requirements for each level and each room, seeng that the requirements are very well balanced throughout the factory. Varnafinde wrote: A hunter on the MH Forum posted a picture of all the upgrade requirements. Actually, the problem was that I was distracted and every time I came back to figure out where I needed to be and what supplies I was saving for, I had forgotten from the previous time I had looked. So I wrote them down on the forum so I'd remember. Currently lvl 4 in the Pump Room and Break Room. I plan on leveling both of them to five before leveling up the Mixing Room and QA Room (which are both level 2 atm). Yes, one thing is knowing what you need for each level, another is knowing how far you've got towards what you need. And a list of what you've got is easier to maintain on this forum than anywhere on MH. I've levelled up both Pump Room and Break Room to level 5, and I've reached level 3 in Mixing Room and level 2 in QA Room. I'll upgrade those last two alternately. Then I've caught Vincent 3 times and bought the Journal Theme and the trap skin for the Infinite Labyrinth trap (using it at the moment, just for fun). Usually I buy all LE traps for collection (even though I have better traps of both power types), but as these Golden Punch Tickets require a boss catch each, I'll have a look at other useful stuff to buy with them first. I'm a bit behind the rest of you (I have two rooms at 5 and two at 4, but I'll be finishing them all up today) but it's all good...I've discovered that an event focused on SuperBrie doesn't excite me too much. But it's been nice passive play which is great since I've been so busy lately. Looking forward to Easter, though. I watched the most recent FBF and the Devs are considering making big changes to Easter in the future (good changes, IMHO)...basically making new egg hunting all year-round or all spring, and only duplicates/charging during Easter. Something like that. I'm a big fan of that idea since it allows for adding HARDER eggs and would help players feel like it won't take multiple years of the Easter event to catch up with new eggs being added every year. I've got the QA room to finish up. I lack 27 mixing rods. So I'll be in the mixing room till that finishes. I miss the cupcakes, but I can see how this works. I wish they wouldn't touch the easter event. Making it a full spring event I get, but not all year. I need to get more of the charge charms this year. My stock of those are low. I've got a TON of the eggstra charms. This event has been a lot more passive-friendly than it first appeared. I'm grateful for that. I still have two rooms to max out on levels but not sure how many more runs I'll go for. I can see good and bad effects from that sort of change to the egg hunt. I'm not strongly opinionated either way, though. So apparently dusting off the Nannybot came in handy. I was having trouble catching the dinosuit mouse for the map. Pulled that out and it was catch #1. Not sure why I thought about that one. lol. Figured it was just random chance. It was still funny though. I can't say this event is doing much for me, though the SB+ is nice. I thought today was the last day and then saw, no, it's next week. And now I don't necessarily have my beloved Egg Hunt event to look forward to either. Oh well, I'll still prep for it just in case. I'm about done with this one as well. It hasn't really done much outside of a couple of hundred SB. It's not really a good event to run for very long. They need to shorten it to two weeks or so. fantasia wrote: I can't say this event is doing much for me, though the SB+ is nice. I thought today was the last day and then saw, no, it's next week. Setting up officially for the Egg Hunt. Getting into the end of Wave 3 in the Warpath and the Meteor in Fort Rox. Need to max out my amplifier for Z's Tower. Also need to check the Lab and Mousoleum stats to see what I need to do there. I was 4 catches away from reaching my 25th Vincent - and from buying another Baitkeep charm (I got 3 of them, and some Ultimate Lucky Power charms). For once I decided not to buy the LE traps, which I would never have used anyway. I found that I had more fun doing event maps than doing event tourneys. At least in this event. The rooms were useful for being able to concentrate on silvering just those mice that were missing - I now have 1 more mouse to silver in each of 3 of the 4 rooms. Plus I need to silver Vincent, of course. The other two new mice were possible to silver, and I did. I did catch a Glitchpaw! and gotten 1412 Party Charms. One of each of the Factory Parts are left lying around in my inventory just for fun for one year - if they are used again next year, any left over from 2019 will first be removed. Factory Parts will only be there for one week. They will disappear from inventories when the factory disappears next Tuesday. I must confess I ran out of patience for this event, even with SB for the reward. I went and hunted elsewhere for a while and came back when I had to be offline. Checking the boxes on Egg Hunt prep. Ready to go at Fort Rox. I'm kind of ready in the Warpath, though I realized there's a better spot to be. But that means lapping all the way around from wave 4 to wave 3 again. Maybe if I run out of things to do. Currently gathering Cemetery Slats in the Mousoleum. I think..... I am fully prepared for the egg hunt. Supplies are fully stocked, areas are ready to go, and I'm having trouble finding places to hunt. It did not take long to get all of the eggs yesterday. I finished 21st overall. Working on a Lightning map now.